If Canadian radio archives do not contain as much material as they should, there is one historical event well documented - the achievement of Guglielmo Marconi, an Italian who made radio history by transmitting the letter "s" in Morse code from Cornwall, England to a receiving station on Signal Hill overlooking St. John's Harbour in Newfoundland on December 12, 1901. But an equally historic event, the achievement of a brilliant Canadian inventor, Reginald Aubrey Fessenden, is generally ignored and largely unknown. 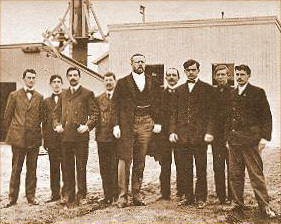 On December 24, 1906, at 9 P.M. eastern standard time, Reginald Fessenden transmitted human voices from Brant Rock near Boston, Massachusetts to several ships at sea owned by the United Fruit Company. The host of the broadcast was Fessenden. After giving a resume of the program Fessenden played a recording of Handel's "Largo" on an Ediphone thus establishing two records - the first recording of the first broadcast. Fessenden then dazzled his listeners with his talent as a violinist playing appropriately for the Christmas season, "Oh Holy Night" and actually singing the last verse as he played. Mrs. Helen Fessenden and Fessenden's secretary Miss Bent, had promised to read seasonal passages from the Bible including, "Glory to God in the highest -and on earth peace to men of good will," but when the time came to perform they stood speechless, paralyzed with mike fright. Fessenden took over for them and concluded the broadcast by extending Christmas greetings to his listeners - as well as asking them to write and report to him on the broadcast wherever they were. The mail response confirmed that Fessenden had successfully invented radio as we know it. Technically, he had invented radio telephony or what radio listeners would call "real" radio as opposed to Marconi's Morse code broadcasting. Fessenden could truly lay claim to be the inventor of radio and he fully expected the world to beat a path to his door. Instead, he never received his due recognition, lost control of his patents and the ensuing revenue which made other inventors and companies immensely wealthy. Even today the Encyclopedia Canadiana does not give him a separate listing. Mention of him is only included under the listing for his mother Clementina who established Empire Day in Canada. Reginald is mentioned as one of her four sons, "inventor of the wireless telephone, the radio compass and the visible bullet for machine guns, he also invented the first television set in North America in 1919." Unlike Marconi who received a grant from the Canadian government to continue his experiments in Cape Breton, Fessenden was neither a good businessman nor an accomplished promoter. Born in 1866 near Sherbrooke, Quebec, he received his education in Canada but left to work in the field of electricity in the United States. He became chief chemist for Thomas Alva Edison who was developing his power company at that time and later left to work for George Westinghouse. Westinghouse, impressed with Fessenden's brilliance, agreed to make instruments and machines for him when he left his employ to become head of the electrical engineering department of the University of Pennsylvania. Fessenden in turn was to remain available to Westinghouse for research. It was an excellent deal for both and gave Fessenden the chance to work on the theories of Henrich Hertz of Karlsruhe who had studied electromagnetic waves - and discovered they could travel through walls. Many young inventors of the time were also frantically studying Hertz's theories in the hope of improving on the Morse Telegraph System by developing a wireless version. The race was on and Fessenden was in it. But in 1896 Marconi's successful experiment on Salisbury Plains in the U.K. where he transmitted a radio signal netted the inventor �76,000 from the British government for the patent. Discouraged because Marconi seemed to be leading the race, Fessenden took off for a long holiday near Peterborough, Ontario. His radio ideas had dried up on him and he was thoroughly depressed. It was while he was daydreaming beside a lake during his holiday that the ripples on the lake spreading out from a stone he had dropped, gave him the idea he needed. What if sound waves travelling out from the centre were continuous like the ripples on the lake? Fessenden was on the right track and nine years later he'd prove it. Rejected by McGill in favour of an American professor for the university's vacant electrical engineering chair he returned to his Pennsylvania job and worked furiously on his new theory. It was during this period that by accident his assistant, Mr. Kitner, jammed a Morse code key which howled over a receiver and was transmitted to Fessenden in another room. Fessenden concluded that if the howl could be carried voices could too, and he decided that what was needed were very fast controlled waves of high frequency which would carry sounds. Fessenden theorized that the fast frequency could be broadcast with program information, and a receiver could isolate the program information from the carrier and leave sound for his listeners. Fessenden knew that his previous experience in electrical engineering while working for Edison and Westinghouse would help him to design and build a high-speed generator or dynamo to carry his information. If he could get a steady enough set of radio waves he knew he could put voices or music "on the air". But he needed a lot of money to design and build his generator and most of all he would need time - he would have to leave his university work and concentrate on his inventions if he was to prove his theories. In order to make some money, he demonstrated the telegraph equipment which he'd been developing at the University to the United States Weather Bureau and sold them on the use of radio (with future improvements), for weather forecasting. He figured he could develop transmitters and receivers for the U.S. Weather Bureau and at the same time develop his other theories while using their generators. His Morse system functioned on primitive slow speed generations but Fessenden had convinced his new employer that a faster and better generator would do a better job for Uncle Sam. Fessenden's deal included retaining the ownership to his design and inventions. Fessenden's new lab was at Cobb Island in the Potomac River, where he was experimenting with a receiving station at Arlington, Virginia, fifty miles away. He and his assistant Thiessen had perfected Morse transmissions using a new generator they had bought, and in October of his first year Fessenden experimentally hooked up a microphone to the improved system. On December 23, 1900 Fessenden said into his microphone, "One, two, three, four. Is It snowing where you are Mr. Thiessen? If so telegraph back and let me know." Thiessen replied by telegraph in Morse code that it was indeed snowing. In great excitement Fessenden wrote at his desk, "This afternoon here at Cobb Island, intelligible speech by electromagnetic waves has for the first time in World's History been transmitted." This was almost a year before Marconi's transmission in Morse code from England to Signal Hill in Newfoundland, on December 12,1901. Fessenden's employers, the U.S. Weather Bureau, were pleased and Willis Moore, Fessenden's boss, suggested he move his experiments to North Carolina to experiment between Cape Hatteras, Roanoke and the mainland, a hundred-mile triangle. But things now began to go sour for Fessenden. On December 12, 1901 Marconi successfully transmitted across the Atlantic Ocean to St. John's, Newfoundland. Fessenden had wanted to beat Marconi and again he had failed. His employer, Willis Moore of the U.S. Weather Bureau was trying to shake down Fessenden for a share of his patents and this was causing strain as well. Fessenden complained to Theodore Roosevelt, without success, and in August 1902 Fessenden left his job and went to Bermuda where his wife's family lived. Fessenden was now forced to continue his search for financial backing for his experiments. He approached the Canadian Government which had already spent $80,000 supporting Marconi at Glace Bay, but was refused. So back to the U.S. he went where be teamed up in Pittsburg with two millionaires, Given and Walker, to form the National Electric Signalling Company, and built two wireless stations near New York City on each side of Chesapeake Bay, later adding three more at New York, Philadelphia and Washington. Despite his setbacks Fessenden was making tremendous strides in Morse code transmission and the company now held an enormous number of American patents. He was also gaining a worldwide reputation as a scientist, but unlike Marconi he remained a lone-wolf experimenter. Even though Marconi's successful transmission across the Atlantic had resulted in both publicity and adulation for the Italian scientist, Fessenden was convinced that Marconi's "whiplash" method, an "on and off" type of transmission, did not work well enough. Most researchers were pursuing the "whiplash" idea because they could not accept the idea that electromagnetic continuous waves could be created, loaded with a program, transmitted and then eliminated leaving only the program for the listeners. Fessenden's mathematical background made this abstract idea easy for him to grasp. Other inventors who had not had his training were still fumbling along for solutions without any real knowledge of exactly where they were heading. Meanwhile, the next major step for the National Electric Signalling Company was to build radio transmission towers at Brant Rock near Boston and in Scotland for trans-Atlantic experiments. Despite his disappointments in Canada Fessenden remained a true patriot and rather than transmitting from the U.S. he wanted to transmit between Canada and Europe. So on July 20, 1906, by an act of Parliament, Fessenden formed a Canadian company supported by Sir Robert Borden and other influential men, called the Fessenden Wireless Telegraph Company of Canada. Canada was now sewn up by Fessenden but there were other problems at the radio station at Machrihanish in Scotland. The technicians involved couldn't seem to get the hang of the equipment and the station could not receive even over short distances. Fessenden was furious. He was so confident that the fault was with the technicians and not with his plans that he sent Armour, his best engineer, to Scotland to take over while he continued his local experiments in the U.S. and did the paper work required to clean up his 300 patents. At about this same time Fessenden was also learning a little about the effect of weather conditions on radio broadcasts. He'd been experimenting enough to know that cold weather and long nights were good times to transmit and that warm weather during daylight time was poor or impossible. On the night of January 3, 1906 the weather was ideal - cold and dark. Fessenden adjusted a gadget on his transmission tower which resembled an umbrella frame and started transmitting Morse code to Armour in Scotland. Later that night a cable arrived saying "We are getting you Brant Rock, loud and clear." It looked as if things were beginning to jell for Fessenden now that he had finally perfected an invention similar to Marconi's but more reliable and less slapdash. It wasn't reliable enough, though, to work through the following spring, and there still remained problems to iron out. When the cold and dark weather returned in the fall he resumed his Trans-Atlantic Morse experiments and his local voice experiments, and in November he received a "personal" registered letter from his engineer, Armour, at Machrihanish which both delighted and shocked him. The letter said, "at about 4 o'clock in the morning I was listening in for telegraph signals from Brant Rock when to my astonishment I heard instead of dots and dashes, the voice of Mr. Stein telling the operators at Plymouth how to run the dynamo. At first I thought I must be losing my senses, but I'm sure it was Stein's voice for it came in as clearly as if he were in the next room." Fessenden frantically checked the logs which recorded the various tests and satisfied himself that he'd actually invented equipment which could and did transmit voices across to Scotland. It had been a happy accident, but another accident now took place which stopped Fessenden cold. A storm wrecked his Scottish receiving tower on December 6, 1906. There was still another shock in store for Fessenden. He learned that Marconi had been given exclusive rights to build wireless stations in Canada. So much for Fessenden and his Canadian company. The idea that Marconi, an Italian, received not only the approval but support of the Canadian government which Fessenden, a Canadian, had been denied, infuriated and frustrated the inventor. He had to prove his genius, prove to the world and Canada that he was the real inventor of radio. He held a contract with the United Fruit Company which had installed wireless systems on the boats to control the harvesting and marketing of bananas in Puerto Rico, and Professor Fessenden decided to give a Christmas present to his customers on the dozen or so ships of the United Fruit Company at sea. He told the wireless operators to listen on Christmas Eve for "something different". At 9 o'clock the operators heard the familiar "C.Q." which means "listen all stations" from Brant Rock and then they heard Fessenden's voice speaking. On that cold December night Fessenden knew he had given the world one of the greatest Christmas presents it would ever receive. Without wires across vast distances, he had transmitted human voices. The word was made known and Fessenden truly believed the world was now at his feet. Instead, the rest of Fessenden's life was a constant struggle for recognition for his inventions and compensation from his rich partners who had sold his patents out from under him to large American companies. Fessenden returned to Canada from time to time but he never settled here again and died finally, relatively unknown, in Bermuda. American books that do condescend to recognize Fessenden's achievement describe him as the "American Marconi." Perhaps it is just as well he never had the chance to read that.